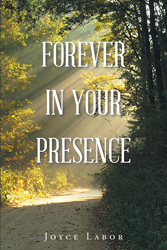 “Forever In Your Presence” from Christian Faith Publishing author Joyce Labor reminds readers that God is ever-present. Whether faithful or lost, God will always be there to offer guidance and help His Children along the path of life. “Forever In Your Presence”: a reminder that God is ever-present in the lives of all His Children. “Forever In Your Presence” is the creation of published author, Joyce Labor. Joyce and her husband, Charles, live in central Pennsylvania. Joyce started writing at an early age to cope with loneliness and fears stemming from a dysfunctional family life. Her deep love for family and animals has been a blessing in her life, as well as a source of loss and heartache. Her desire is to mend the broken hearts of others by sharing God’s love and healing grace. Published by Christian Faith Publishing, Joyce Labor’s new book reminds readers that God is forever present. The path in the woods represents the path people choose to take on their journey through life. The sun rays lighting the path symbolize God’s presence and His guidance. When people stray from His path, they will struggle to find their way through the darkness. He will, however, patiently wait until the lost see the light and return to the path that He created for all of His Children. “Forever In Your Presence” is a reminder that no matter how far along the path someone is on their journey through life, God is forever watching. He is forever guiding His Children. He helps them from their very conception in the womb. He is there throughout life to the grave and beyond into His Kingdom. View a synopsis of “Forever In Your Presence” on YouTube. Consumers can purchase “Forever In Your Presence” at traditional brick & mortar bookstores, or online at Amazon.com, Apple iTunes store, Kobo or Barnes and Noble. For additional information or inquiries about “Forever In Your Presence”, contact the Christian Faith Publishing media department at 866-554-0919.